December will be long remembered as the month when Von Runstedt started his great counter offensive against our ground forces, and almost forced his way to his objective, the Meuse River. It will be remembered by the air forces as a slow starting month, where on many a day we chaffed at the bit, cursing the weather, the all important factor that was keeping us grounded. Then, when the big German attack came, the Hun attacked during a period when he knew the air forces would not be able to operate. A tribute to his evaluation of the Allied power in the air, and the importance of striking when the ground forces would be without the aid of their “Buddies in the Sky”. We sat by silently for days, gnashing our teeth and, like Elijah praying to Bael, we silently offered our prayers for a let up in the weather so that we could be airborne and help our brothers on the ground. And as the Lord answered Elijah, so did He answer our prayers, as on the 24th the weather cleared and we started a 12 day air offensive which lasted until 3 January 1945. 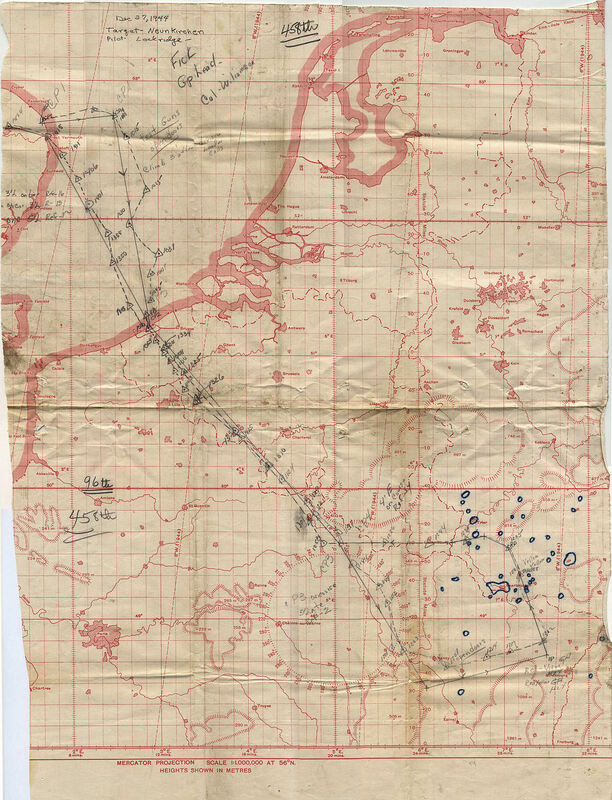 During this lengthy offensive we struck at the Hun’s lines of communications, marshalling yards and bridges, and our efforts combined with the never-to-be-forgotten efforts of the ground forces stopped the Hun just four miles from his objective and started pushing him back. Our tenth month of operations in the ETO started on 4 December when we attacked the M/Y at BEBRA, 20 miles SSE of KASSEL. Led by LT COL WILLIAMSON and CAPT QUINN, 18 of our A/C were over the target, 177x550 GP’s and 32 M-17’s on the target with the aid of GH equipment with unobserved results due to 10/10th cloud coverage. Another M/Y was to be our victim on the 6th, namely our old friend BIELEFELD. 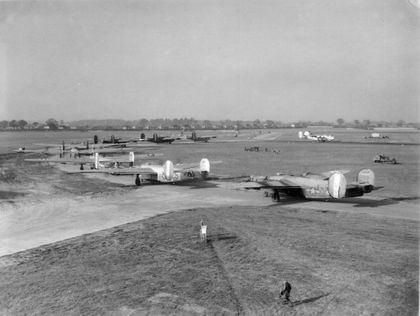 Our bomb load of 126x1000 GP’s was dropped by our formation of 17 A/C led by LT COL HOGG and MAJOR DARELIUS. Although the bombing was accomplished with the aid of H2X equipment, a 50 second visual correction was made through breaks in the clouds with the following results: crews from lead squadron report good pattern in M/Y. Second squadron slightly to SE of M/Y. No bursts visible in SAV’s of lead section due to cloud cover. SAV’s from high right section show small number of bursts 1800 feet east of the M/Y, however, major portion of pattern is covered by cloud. We were not alerted again until the 10th and on that day we attacked the M/Y at BINGEN, 30 miles SW of FRANKFURT, at [the] junction of Rhine and Mosselle Rivers. 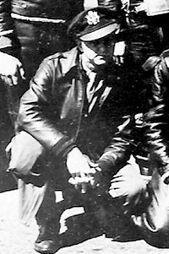 MAJOR JAMISON [and] 1ST LT WAGNER (left) led our formation of 18 A/C, dropped 728x100 GP’s and 34 M-17’s on GH lead with unobserved results. However, marker bombs from all groups and wings were well bunched and GH lead felt he had a good run. We were up again on the following day the 11th, still hammering at the Hun’s communication lines. Our large formation of 43 A/C attacked the MARSHALLING YARDS at HANAU located 10 miles east of FRANKFURT. The formation was led by MAJOR’S HINCKLEY, BETZOLD, BREEDING and CAPT’S BOOTH and QUINN. A large bomb load of 250x1000 GP’s were dropped on the primary target by H2X methods through 10/10ths undercast with unobserved results. 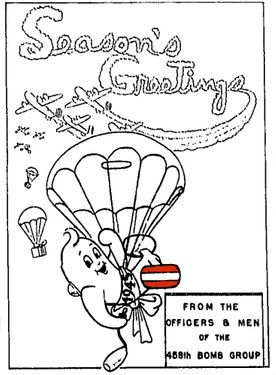 We understand that on Christmas Day of 1943 no A/C were over enemy territory, and we justly think it should be so in honor of that holy day. 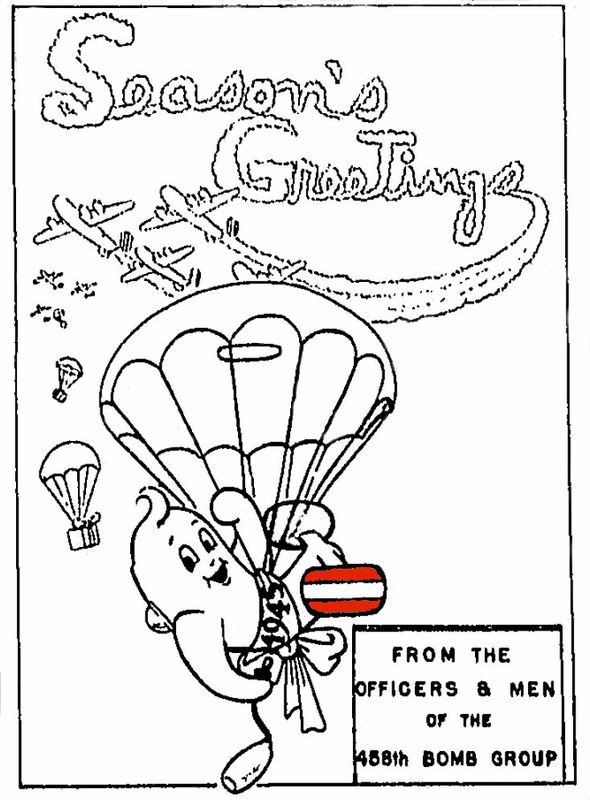 But, we were not surprised to find ourselves alerted Christmas Day, and rather than feel it sacrilegious to be bombing this day, let us rather think [of] it as a Christmas present to the boys battling on the ground under the worst conditions imaginable. Let us just call our efforts this day, a present to the ground forces. 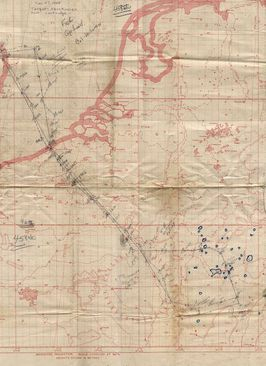 Still following up closely in support of the ground operations, our assigned target this day was RR TRACKS and YARDS at PRONSFELD, GERMANY. Twenty-four of our A/C were over the targets led by CAPT’S LAMERS and QUINN, dropping 348x300, 20x250 GP’s and 46 M-17 incendiaries with the following results: 16 A/C attacked PRONSFELD visually. Crews report incendiary bombs dropping on R.R. tracks and GP bombs over and short of R.R. SAV’s show bombs hitting 1300 feet NE and 1200 feet N of assigned MPI. 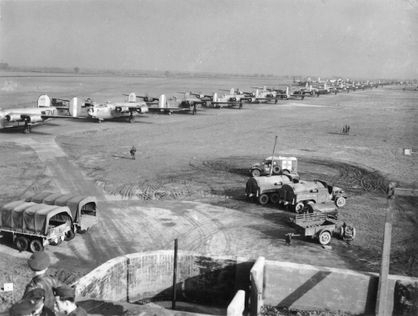 GP’s hit highway and a few incendiaries hit R.R. tracks. 8 A/C attacked PELM visually. Crews report hits on R.R. track near town. SAV’s show hits on R.R. track in town. Another good day for the 458th. On the following day we were again airborne hitting the same type of target, the M/Y at ST. WENDEL. Although 26 A/C were over the target area, due to malfunctions in the GH Lead, no bombs were dropped. Rather rough to bring our bombs back but we could not take any chances of dropping on friendly troops. After one day of poor weather we continued again on the 30th with a GH mission on the NEUWIED bridge just NW of COBLENZ. Twenty-seven A/C led by MAJOR JAMISION, CAPT’S QUINN and WILLIAMS dropped 155x1000 GP’s with unobserved results. And so ushered out 1944, and our fervent hopes go high that we will have this fracas over with before another year ends.